Native American Indians were a deeply spiritual people and they communicated their history, thoughts, ideas and dreams from generation to generation through Symbols and Signs such as the Circle symbol. Native American symbols are geometric portrayals of celestial bodies, natural phenomena and animal designs. The circle is used as a basis for many symbols including the Sun symbol, the cycle of the seasons and the cycle of life to death to rebirth and the four elements. The circle is symbolic of equality, where no person is more prominent than any other person. Circle meetings ensured that all people were allowed to speak and the words spoken were accepted and respected on an equal basis. A circle around other Native American symbols signifies family ties, closeness & protection. The circle has no break and holds that which cannot be broken. The four elements is represented by the Hopi tribe with the following circle, called the "Cosmic Cross" or the Cross in the Circle - Solar Cross Symbol. which means the world. The four bars represent north, south, east and west. The individual elements of Air, Fire, Water and Earth are each represented by a circle. The elements are the four great primary forces emanating from the Creator. The fire circle represents warmth and light. The air symbol represents life. The water symbol represents the sustenance of life. The four circles inside the outer outline on the Earth symbol represent the four nations (the first four tribes of mankind) which came to the world to keep balance. The cross in circle was one of the most sacred symbols of Native Americans as it represented the Sun, Moon and fire. There are many other circle symbols that have been used by both the Mound Builders and the Native Americans. many are presented in combinations with other icons such as Cross Symbols. The following cross and circle symbols relate to the Four Great Primary Forces and their place in the universe. There were many Sun symbols that utilised the shape of the circle with rays emanating for it. 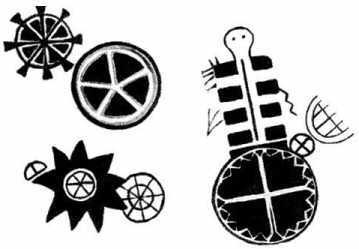 The following Native American Circle Symbols are depicted on ancient Rock Paintings that were found at Santa Barbara. The rock paintings which include various circle symbols and signs were created by the Chumash people of southern California. The circle symbols are believed to be associated with religion and astronomy.